It’s the most wonderful time of the year… if you’re planning on spending the whole month in fleece PJs lying face down in a family sized box of Jaffa Cakes. But what happens when your friends suggest going out? Or, even worse, out out? Picture this all too familiar scene: it’s pitch black, it’s freezing cold, and the idea of swapping your sheepskin slippers for a pair of statement heels is enough to make you sink deeper into the sofa and reach for another Jaffa Cake. So unless you want to shun all social activity until spring, a means of dressing up without being reduced to a shivering mess is imperative. The key here is to mix a bit of glitz with an abundance of comfort. First up, the sequinned roll-neck from MSGM. Ok, it doesn’t scream warmth, but it’s a quick and easy way to jazz up any outfit. It actually works surprisingly well with jeans, trainers and a blazer – hello January outfit. Next up, are the cycling shorts; terrifying on the hanger, but surprisingly wearable IRL. There are two main rules to stick to: size up and go for a non-fitness fabric like velvet which keeps the overall look less Sporty Spice and more sports luxe. 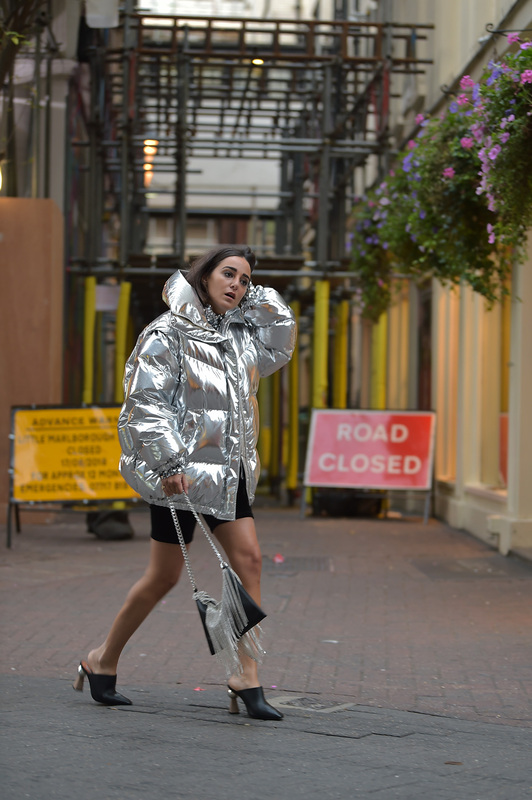 Finally, invest in an oversized puffer which you won’t want to take off from now through to March. 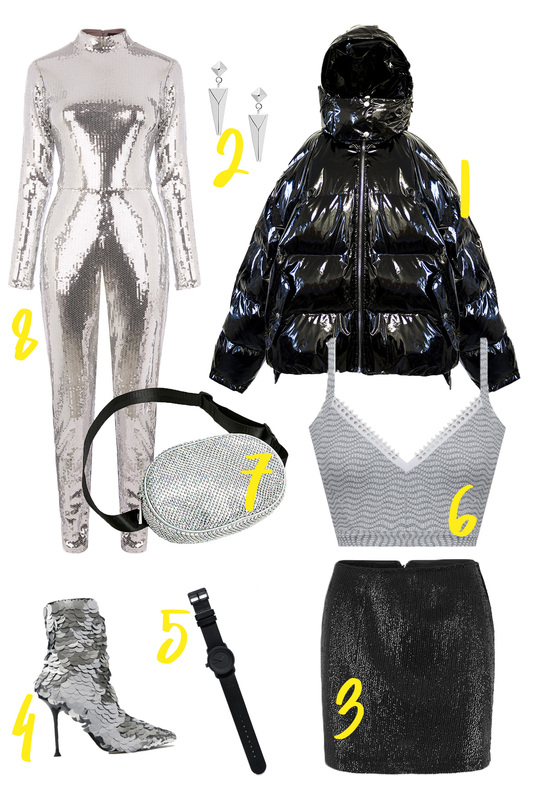 There are so many options to choose from, but why go for understated when you can go for high-shine silver? Not only does it work on a tonal level with the sequinned top underneath, but the combination of the two will make it even easier for your Uber to spot you at the end of the night. In the off-chance you’re in the mood for heels, I would highly recommend this pair of mules from Topshop, which are quite unassuming from the front but have a surprise, statement heel that gives them a super designer feel. Alternatively, a pair of box-fresh white trainers will look just as cool and no doubt keep you on your feet for a whole lot longer into the night. This leather and chain bag ties everything together nicely whilst the multiple strands of diamantes gives it a nostalgic nod to all things 90s. All in all, it is possible to do party without all the faff and effort that usually goes with it but if you’re still not convinced, follow my lead and stay put – wine in your PJs is always a good idea. 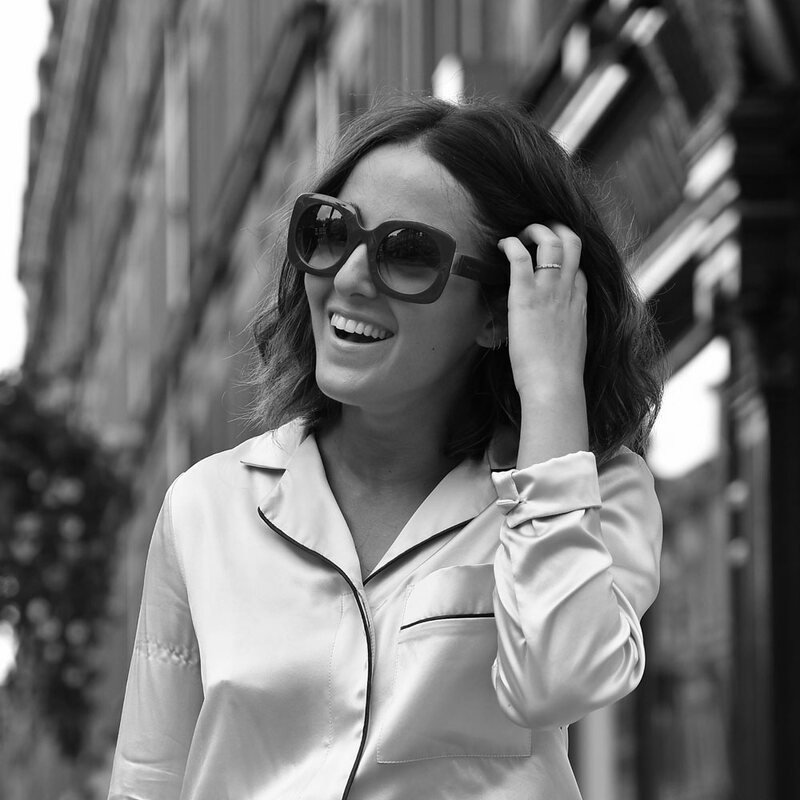 Nini is a London-based stylist and Contributing Editor at PHOENIX. With over 10 years experience working on the UK’s biggest-selling magazines, she currently splits her time between styling celebrity and fashion shoots for PHOENIX and working with a host of commercial brands in a consultancy and styling framework to create some of the biggest ad campaigns on the market.